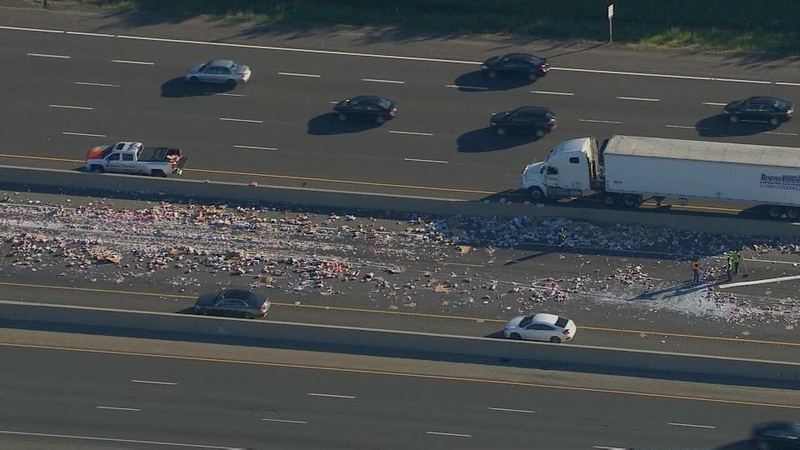 Westbound Highway 401 is partly closed near Meadowvale Road in Scarborough following a collision involving a truck that was carrying a load of yogurt. Police say that the truck collided with an overhead sign support beam at around 3:30 a.m. The force of the collision ripped open the trailer, causing containers of yogurt to spill across the roadway. Ontario Provincial Police Sgt. Kerry Schmidt tells CP24 that crews are now unloading the remains of the trailer as it is no longer structurally sound. He said that work is also underway to remove the yogurt from the roadway itself, an effort that he described as a slow process. At one point all of the westbound express lanes and two westbound collector lanes were closed but Schmidt said that one express lane is now getting through. He said that the 25-year-old male driver of the truck has been charged with careless driving and that fatigue is being investigated as a possible factor in the collision. Meanwhile, Schmidt said that the highway remains a “big slippery mess” and isn’t likely to fully reopen until noon. “I would suspect entire morning rush will be a mess,” he said. 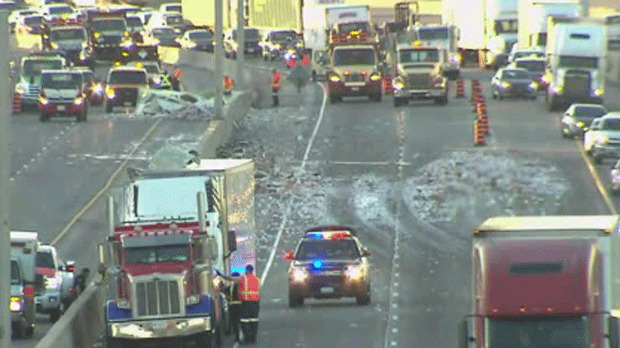 Spilled yogurt is shown on Hwy. 401 on Friday morning following a collision. Traffic is shown backed up on Hwy. 401 approaching Meadowvale Road following a collision involving a truck carrying yogurt.